What’s the story: The Galactic Empire has created a terrifying new weapon, the Death Star, which is nearing full planet-killing power. 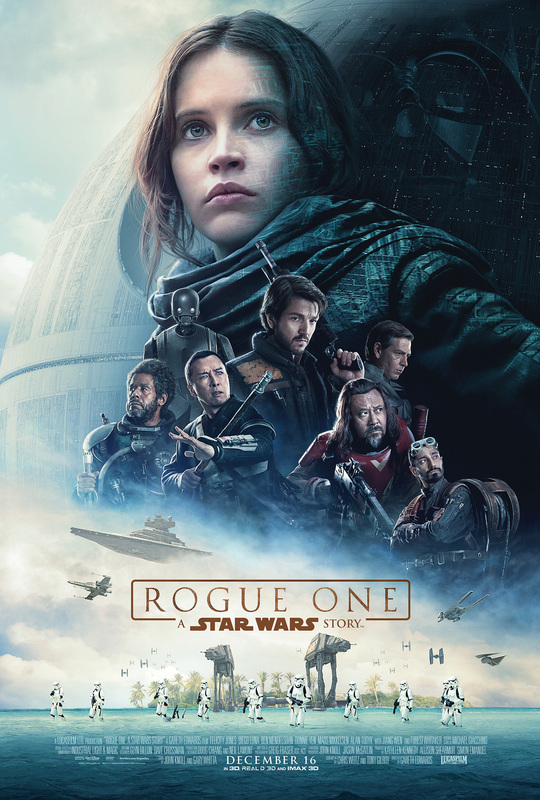 Jyn Erso (Jones), street thief and cynical daughter of the weapon’s chief architect (Mikkelsen), must team up with a ragtag group of freedom fighters and mercenaries to steal plans to the Death Star and deliver them to the Rebel Alliance. What’s the verdict: Despite being a Star Wars movie, Rogue One has a feeling of difficult second album-itis. Or maybe it’s because this is a Star Wars movie; The Force Awakens resurrected the old magic, but memories of mediocre prequels remain raw. And Rogue One is a prequel to A New Hope (Episode IV for the pedants). Does Godzilla director Gareth Edwards deliver on the promise of that awesome teaser trailer and achieve what ultimately eluded Star Wars creator George Lucas? The answer is a relieved yes… but Edwards makes us work for it. The first hour is choppy, erratically paced and often dour when it should be thrilling. Weren’t we promised Where Eagles Dare done as a Star Wars movie (FX genius John Knoll suggesting the “guys on a mission” idea to Lucasfilm)? And certain traditions now expected from a Star Wars instalment are absent in this “Star Wars Story”, including for the first time a John Williams score (Michael Giacchino does a passable imitation). But, there is enough good work to keep hope alive. The opening scene is reminiscent of the shock starter to Sergio Leone’s Once Upon a Time in the West. A skirmish on the Empire controlled desert moon of Jedha delivers early action and introduces Donnie Yen’s “Force sensitive” Zatoichi-like blind warrior Chirrut Îmwe and his surly buddy Baze Malbus (Wiang). Mads Mikkelsen’s Galen Erso and Jones’ Jyn continue the tortured fathers / rebellious children foundations upon which this entire space opera is built. Jones, continuing the franchise’s current penchant for casting posh English women as hardened, damaged leads, is better than expected. Though lacking Daisy Ridley’s breezy charm, she is Princess Leia on a bad day with the cynical cool of Han Solo, holding her own when the blasters start blasting. Diego Luna’s Cassian Ando is Luke Skywalker wearied by exposure to life in the warzone, but still able to rally Rebel troops with stirring speeches, including the spinetingling “Make ten men feel like a hundred”. Unlike Marvel, Star Wars movies know what makes a good villain. Where Mikkelsen had little to work with in Doctor Strange, Ben Mendelsohn is served a spicy slice of villainy to chew on as Orson Krennic. The Death Star’s *gulp* project manager he brims with hubris and malice, fulfilling his KPI of utter bastardy when drooling over the destructive power of his baby. Another favourite villain reappears, courtesy of astonishing ILM wizardry, and Darth Vader makes a triumphant return, with one scene a franchise best (you’ll know it when you gasp at it). But, other characters need more flesh on the bones (Riz Ahmed shines despite his role, Forest Whitaker is underused) and an extended cut may not be a bad idea. Rumoured reshoots by co-writer Tony Gilroy were possibly to increase role of Alan Tudyk’s K-2SO, a comedy relief/action droid who is Threepio, Artoo and Chewie wrapped in one. Then in the second hour, Edwards makes the jump to hyperspace and delivers Saving Private Ryan set a long time ago, in a galaxy far, far away. With AT-ACT walkers. It is as fan-fiction as The Force Awakens, and once again proves the pupils have become the masters. 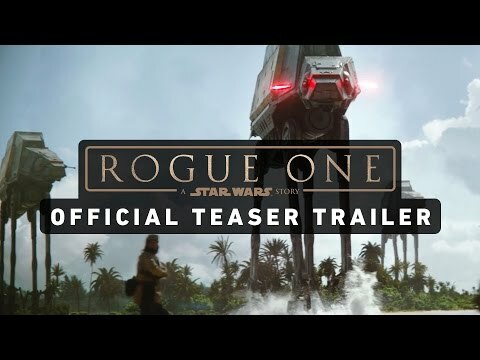 With a full-scale ground assault and aerial dogfight climax, Rogue One continues Disney’s brainwave of allowing fiercely talented directors space to play in the Star Wars sandpit. Familiar Star Wars action scenarios are revisited, revamped and revitalised courtesy of bleeding edge effects and genuine love for the material. Edwards includes a truckload of fan service (the original Star Wars is woven into this movie in numerous inventive ways) and the final moments are likely to either have you bursting into spontaneous applause, accusing the movie of more nostalgia wallowing or complaining that the whole thing was too dark. For now we sit in the former camp, excited at how that difficult third album is shaping up.